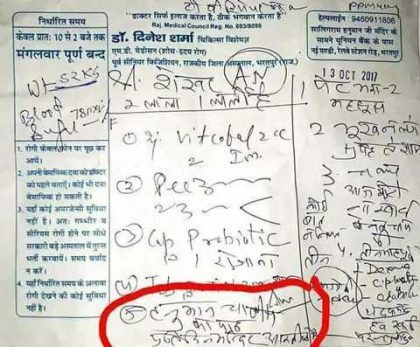 Jaipur: A one of its kind prescription has recently gone viral on the social media where a Rajasthan based doctor, Dr Dinesh Sharma is seen prescribing ‘Hanuman Chalisa’ to his patients along with the medicines. 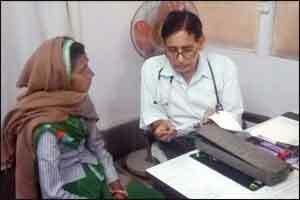 Dr Sharma, a retired government doctor practices in a clinic in Ranjeet Nagar area. Most of his patients are from rural areas, who, he advises, along with medicines, a little dose of spirituality for quick recovery. A prescription slip he issued to a patient on October 13 is circulating virally on the social media. The prescription, which has been given to patient for complaints of stomach ache, primarily contains medicines. However, along with the medicines, the doctors has also prescribed the patient to read the Hanuman Chalisa every day, visit temples and take part in aarti. Sharma said he prescribes the “spiritual dose” to most of his patients. He further said, “They have already taken medicines from quacks in rural areas. Some of them are ill due to stress. I advise them to visit temple and read Hanuman Chalisa to relieve their stress, which makes them feel better,” Sharma adds. I empathize with the doctor who is getting this flak from social media & activists …. WHO defines health as \” Physical , Mental, Psychological, Social & Spiritual well being and not merely the absence of disease \”\’.. The explanation given by the said doctor should be seen in context and is quite justified..